I feed a lot of non-vegans, and whatever I put into their mouths better be spectacular. So, although my dishes contain no artery clogging dairy, eggs, or meat, they do tend to sit a little high on the caloric end of the scale because I use a lot of rich creamy sauces, and lots of added fat in the way of olive and coconut oil (amongst other things). 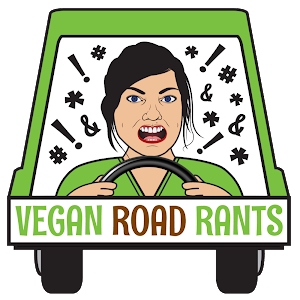 Am I opposed to delicious, over the top vegan foods? Of course I'm not. But even I know that these types of foods should be the exception and not the rule. But as I stated before, I cook a lot of food...and needless to say, I have put on more than a few pounds over the last few years. I figured it was high time for me to do a little self-check and clean up my diet. So, I decided to participate in this year's Engine 2 Challenge. I was already ahead of the curve. I'm already vegan. So for those who aren't, the have to give up all animal products AND give up extracted oils, added salt, processed foods, simple carbohydrates and added sugars. Wow. That would be a challenge. So I feel like I kind of have an unfair advantage over some of the noobs. And...I know a thing or two about a thing or two in the kitchen, and if anyone can make a no oil recipe taste good, it's me! 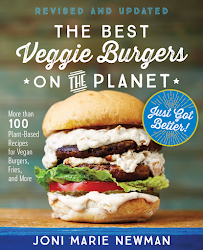 In fact, when I wrote Going Vegan with Gerrie Lynn Adams, the majority of the recipes in that book are oil free, or have a low oil option. Besides, Rip himself gave an endorsement of that book, so I must be doing something right, right? 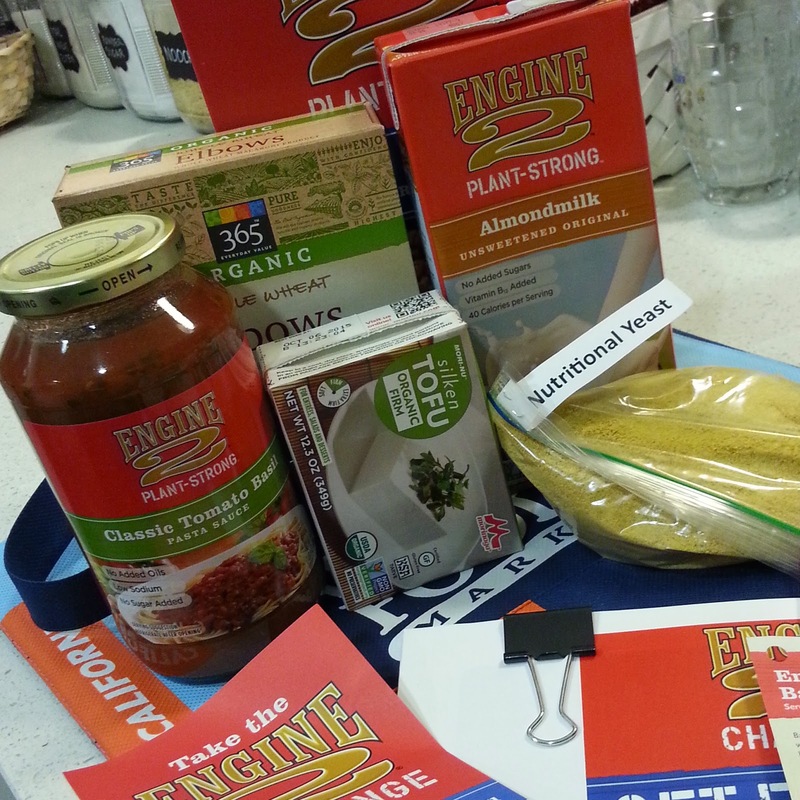 To kick off the challenge all participants received a goodie bag filled with Engine 2 products, recipes, and a copy of the 28 Day Challenge Guide. I thought this was great! Especially for the noobs. Some basics to make sure we had something to eat with minimal effort to get things started. But whole wheat pasta and sauce does not make an exciting meal for Joni Marie. So I got to work on some homemade meals that would satisfy not only my hunger, but my need to be in the kitchen creating, and ultimately my tastebuds. 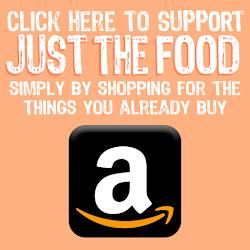 On my first day of the challenge, I did try to eat wahat was convenient and already available at Whole Foods Market. 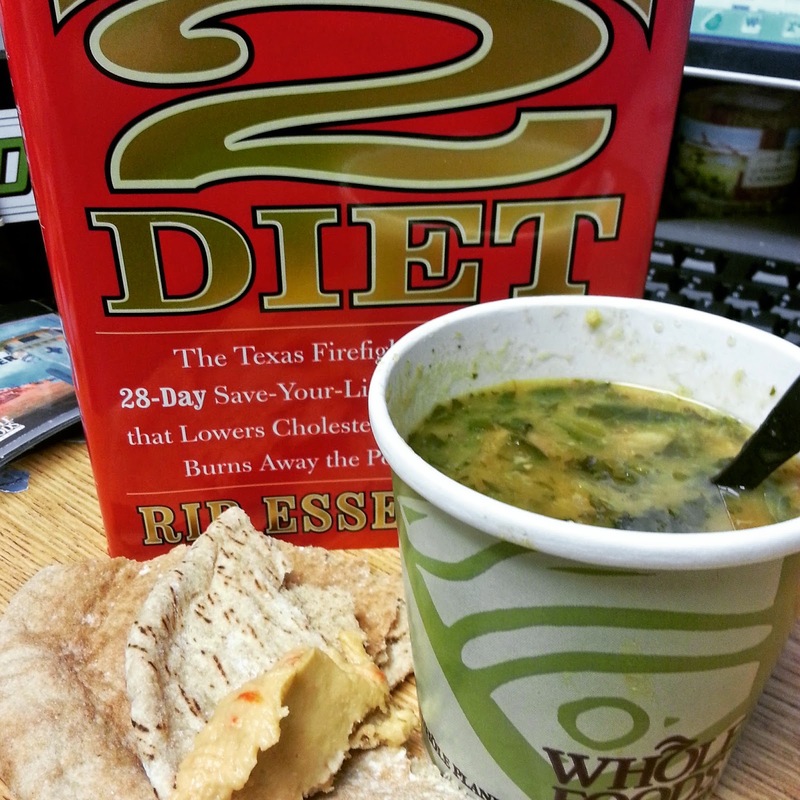 I had a cup of White Bean and Kale soup, some whole wheat pita and some of the Engine 2 Red Pepper Hummus. 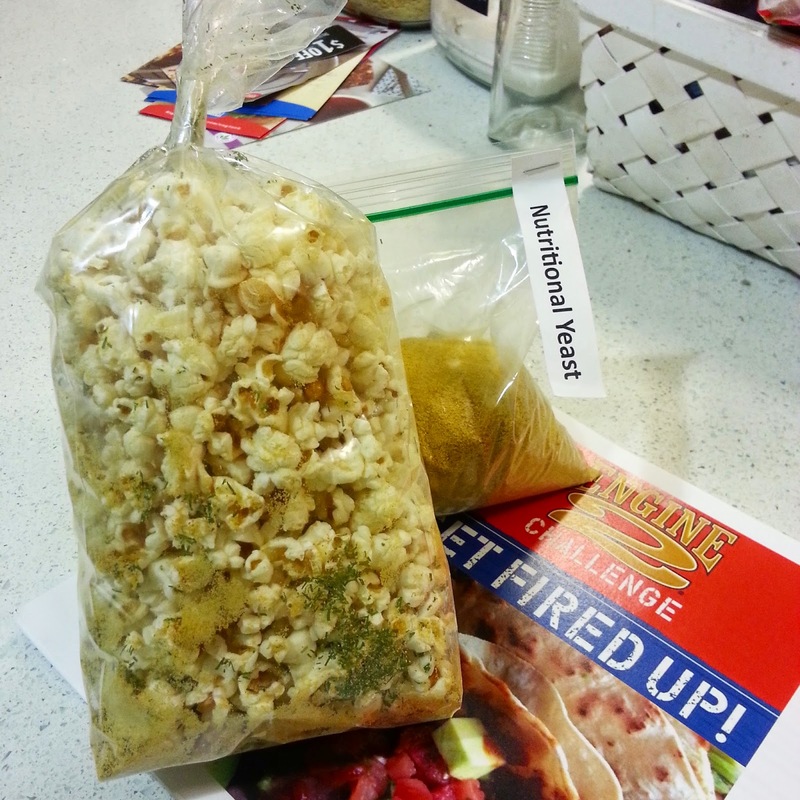 It did the trick, and I was satiated, but I was yearning for more depth of flavor. When I got home on day 1, I was pooped from a long day of work, so I made a bowl of Cereal (Rip's Big Bowl) and called it a day. First thing that second morning, I got up earlt and started on a pot of soup that I could eat all week. A homemade pho broth (The Faux Pho Broth from Fusion Food in the Vegan Kitchen made with low sodium Tamari) and packed it full of brown Jasmine rice, spinach, cilantro, garbanzo beans, garlic, carrots, green and red onions, and my favorite ingredient right now...smoked tofu. This is a good soup. Hearty and filling and nutrient dense. 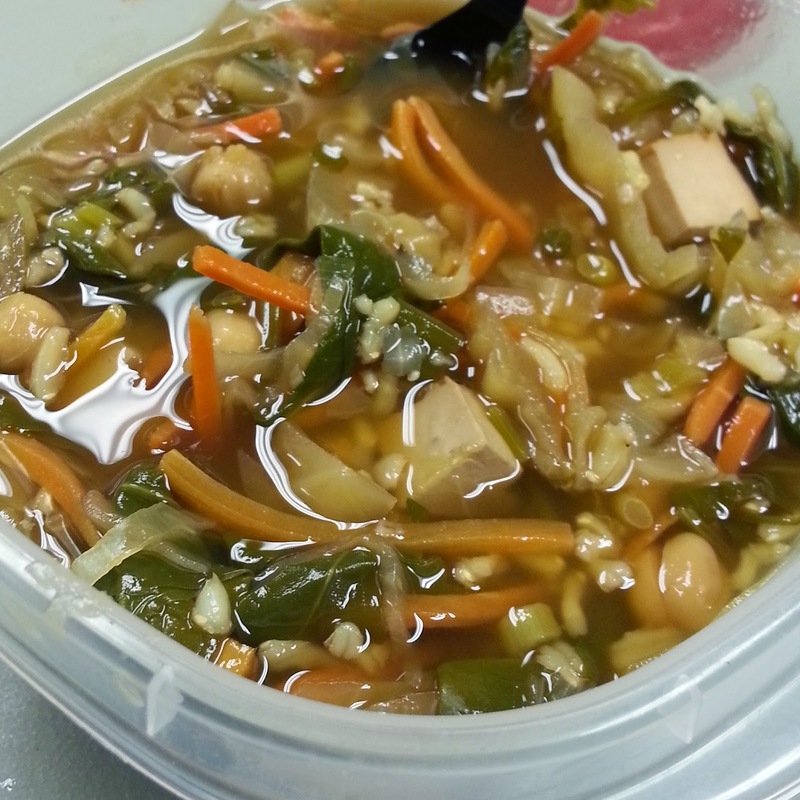 I shared some with other challengers at work, and had enough to eat for a couple of lunches and a couple of dinners. The rest of the work week was full of whole grain toast with nut butter for breakfast, the above soup, a few bowls of cereal, and sandwiches, namely this sandwich that ended up being one of my favorite meals so far. 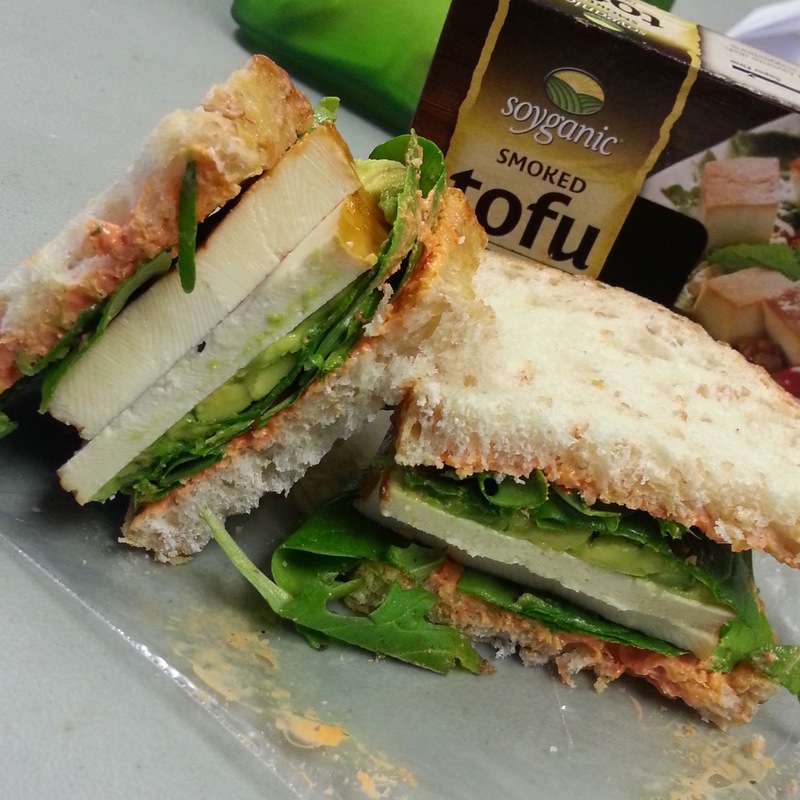 The sandwich is on cracked wheat sourdough and is filled with sliced smoked tofu, avocado, spinach, arugula, and a sauce I made a big batch of that was made by blending together silken tofu, tahini, roasted red peppers, garlic, dill, and a little black pepper. That sauce has been serving me well as a sandwich spread, salad dressing and dip for veggies. Friday approached and a new challenge was put before me. Going out to eat! I have become somewhat of an expert at ordering vegan in non-veg restaurants, but ordering E2 approved in an all veg restaurant proved a little more daunting. So I made the best decisions I could. I had a date with Jackie of Vegan Yack Attack to try out a new all vegan sushi place in Long Beach on Friday. I couldn't cancel, I was dying to try that place out. So I made the best decisions I could. I ordered steamed Veggie Gyoza and a Deep Ocean Roll. 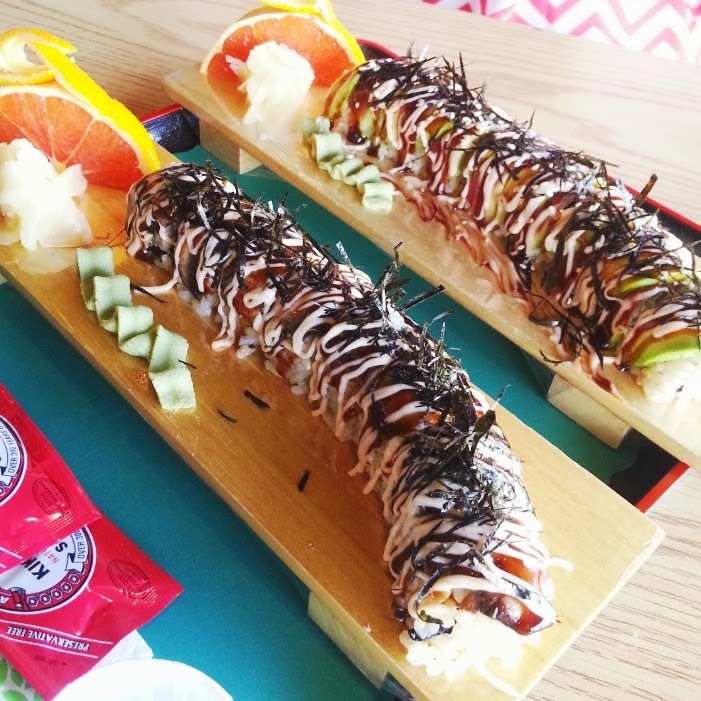 The roll was made with brown rice and had carrot, cucumber, avocado and seaweed. The sauce on top may have been off-limits, but it was a drizzle on top, and not too much, so I thinkI did pretty well overall...Especially considering that I had a date night at the movies with my husband and instead of getting candy, soda and popcorn, I go a large bottle of water and smuggled in my own oil-free popcorn dusted with nooch, garlic powder, onion powder and dill. The following day I had a date with my besty Jen to spend the entire day in downtown LA at the Photo LA and LA Art Show. In between shows we stopped for lunch at Farm LA. Once again, I feel like I made the best decision I could. 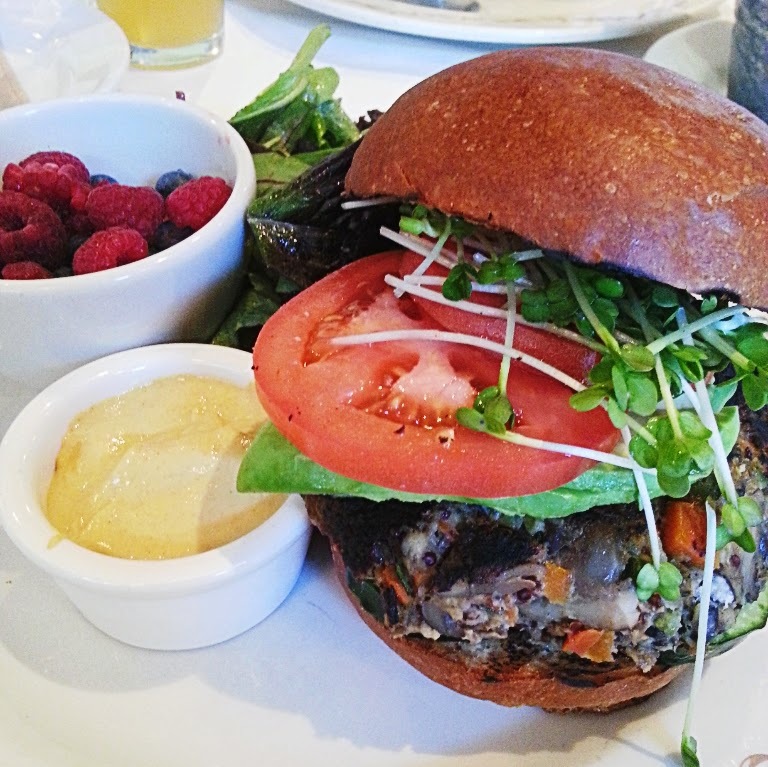 I ordered the Quinoa Black bean burger, with no sauce, just dijon mustard, with avocado and sprouts. Instead of fries, I opted for baby greens and a bowl of berries. Once again, I feel like I did pretty good...Especially considering that evening when we were hanging out, everyone decided to make homemade pizzas, and this girl opted for a green salad with balsamic vinegar. Success and willpower. Sunday came, and I had to go back to work. I put together a lunch kit. I packed up a bag full of arugula, spinach, diced smoked tofu, shredded carrots, cilantro, and sprinkled in some nooch and black pepper. Then I also packed up some of my homemade tahini red pepper sauce. 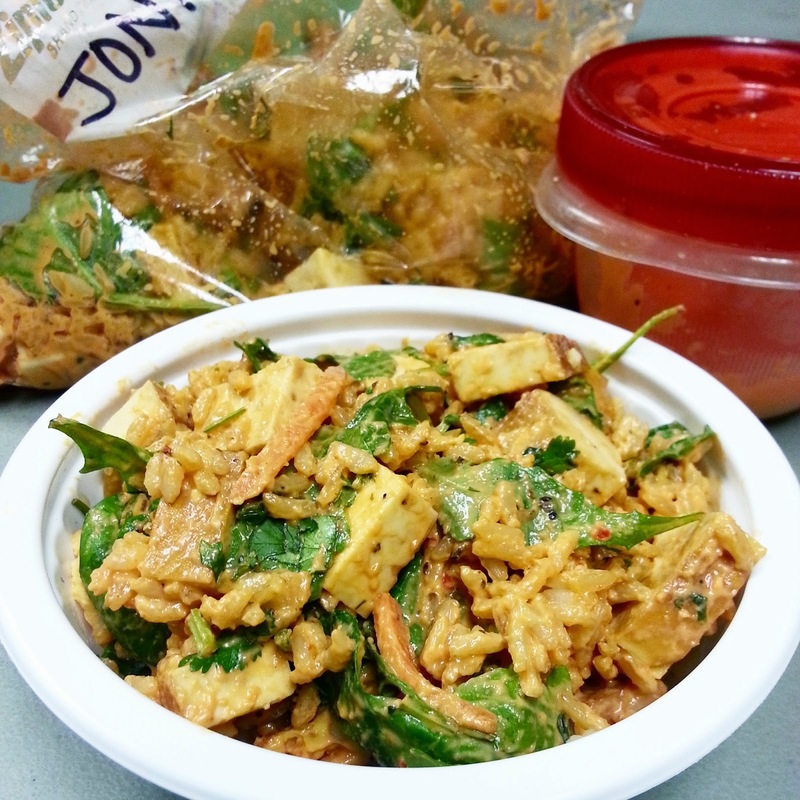 At work I added reheated brown Jasmine rice and the sauce to the bag and gave it a good shake! This has now become my new favorite meal, and it made enough for me to have some today as well. So, there you have it. My first 7 of 28 days of this challenge. I have to say, it's not so bad. I am discovering new recipes and flavor combinations, while not beating myself up if I accidentally have a little salt or oil when I am out. Oh, and I even started the workout plan in the challenge guide. I do it in my kitchen. Lol. I will check back in again next week with a week 2 challenge update, so until then, live long and be Plant-Strong! Full disclosure: Rip Esselstyn has partnered with Whole Foods Market for this year's challenge, and in my other life, I work at Whole Foods Market. And while it is free for anyone to join the challenge, I am also leading the challenge at my location, which is currently in Laguna Beach. I thought it would be an awesome way to help spread the word about a healthy, plant-based, whole foods diet to others, especially some of my coworkers, while simultaneously and selfishly taking the opportunity to take the challenge myself. Good for you. 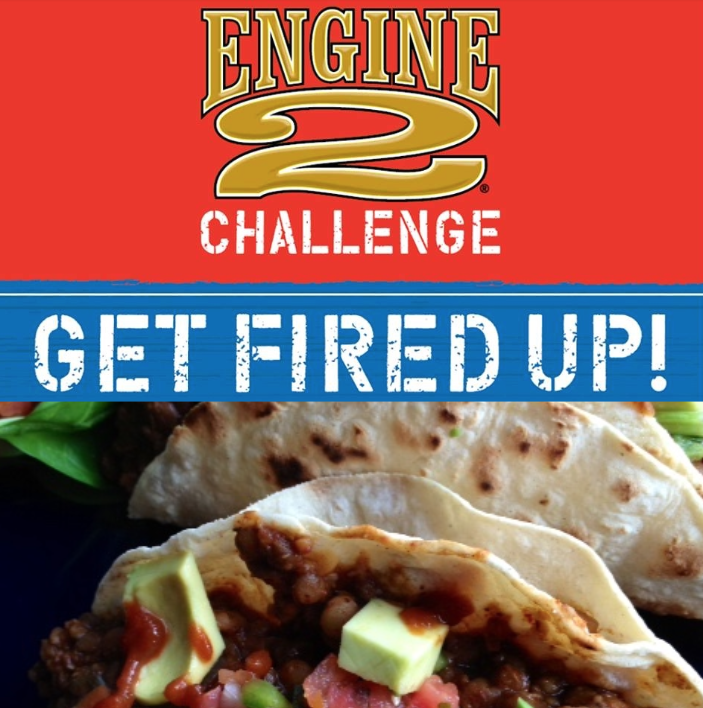 You might like to check out Susan Voisin's Fat Free Vegan blog for great recipes that would fit in with the E2 challenge. Also, Lindsay Nixon's Happy Herbivore recipes are good. On YouTube, check the Veggie Nut (all vegan) and Simple Daily Recipes (vegan for at least the past couple of years). Are you not allowed to have anything sweet? That seems hard, but if you have a sweet tooth, I suggest that you try banana ice cream. I wish you good luck! Sounds like you're rockin' it!! I commend you. I'm doing a mostly raw diet right now, and I cleanse every year BUT oil-free seems like it'd be so much harder! Good luck! 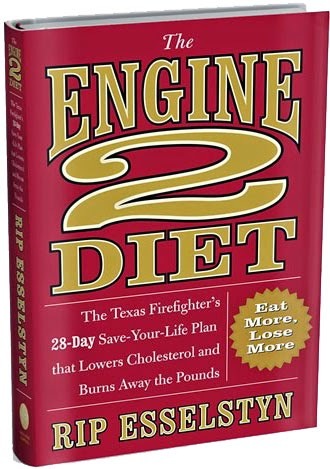 I'm teaching an Engine 2 class at our Whole Foods next week. I do it every year — take one of my recipes and take the oil out. But doing that for 28 days sounds hard!! Thanks for taking the time to write! I will have another update soon. Thanks, Bianca. It gets easier as time passes. It sure makes going out to eat even MORE interesting than simply as a vegan. I've heard that Veggie Grill has some new menu options that fit this way of eating. I haven't been to try it out yet. I'm definitely feeling a detox effect. I won't get into too much detail, but all this roughage is definitely doing a number (a #2! LOL) on me.